This week: Democrats try to make inroads in West Virginia, one Alabama Republican geared up for a primary runoff, and the Supreme Court vacancy continued to shake up the midterms. 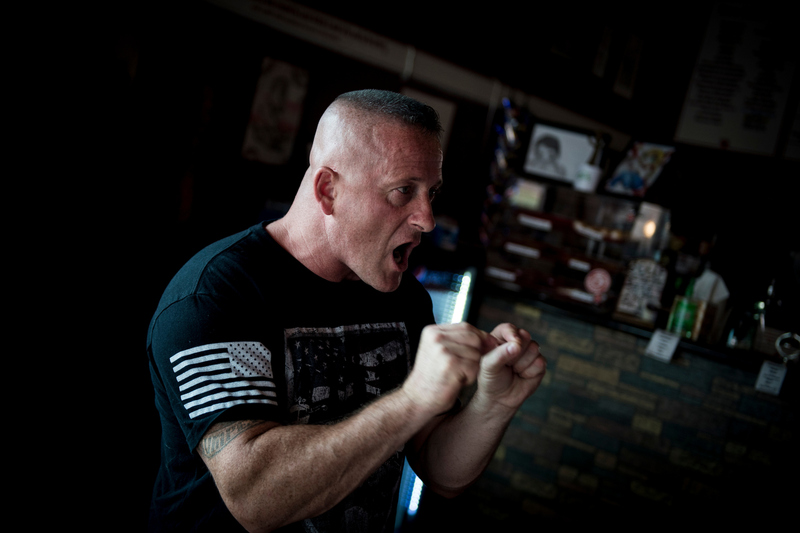 Throwing “Spaghetti at the Wall”: Up until recently, Richard Ojeda’s campaign staff was used to being laughed at, regularly. None of them had ever run a congressional campaign before. But it’s these West Virginians — including a 25-year-old single mom and a long-haul truck driver — who have helped Ojeda come this far. They’re now working with presidential-level consultants who think Ojeda can help Democrats win back voters in West Virginia and flip the House. *BOOKMARK* Inside Elections with Nathan L. Gonzales shifted four key Senate race ratings this week. You can keep track of his Roll Call columns that explain his moves here. Crisis Averted? At the beginning of the cycle, GOP Rep. Martha Roby looked like she could be in trouble. She declined to vote for Trump in 2016 after the Access Hollywood tape came out, and drew a handful of GOP primary challengers this year. But while she was forced into a runoff, she’s now favored to win next week. Here’s why. She Who Shall Not Be Named: Democrat Talley Sergent is touting her West Virginia roots to try to unseat GOP Rep. Alex X. Mooney, who ran for Congress in 2014 after moving from Maryland (where he was the state GOP chairman). The biography section on her campaign site mentions her work for former Democratic Sen. Jay Rockefeller, the State Department and Coca-Cola. It fails to mention, however, that she was the state director for Hillary Clinton’s 2016 campaign in the Mountain State. Coincidence? Probably not. There’s no politician in the state more toxic than Clinton. So does Sergent stand a chance in a district Trump carried by 36 points? Take a deeper dive into West Virginia House races in this three-minute video. A Tilt Here, A Tilt There: Heads up, Senate watchers! Nathan shifted two Toss-up Senate races into the tilt categories. The North Dakota Senate race is now Tilts Republican, while the West Virginia contest shifted to Tilts Democratic. Catch up on the rationale behind the race rating madness here. Court-ing Voters: Remember when President Donald Trump announced his Supreme Court nominee three months ago? JK, it was three days ago. But the push to confirm appeals court Judge Brett Kavanaugh could affect the midterms, especially for Senate Democrats running for re-election in red states. Stu Rothenberg breaks down three potential scenarios in the court battle and how they could play out at the polls. The political arm of the moderate New Democrat Coalition has endorsed 13 more candidates, bringing its current endorsements for the cycle to 27. Find out who they are here. Each candidate received a maximum contribution of $5,000 for their primary, with the endorsement now signaling additional support to come for the general election. It’s not every day that a candidate in a competitive Senate race returns a PAC donation. But GOP Rep. Marsha Blackburn’s campaign said it did just that because the Club for Conservatives (remember them?) “did not meet our standards for transparency.” The PAC is facing new questions from the FEC, Nathan reports in his latest installment on the group. California Democratic prosecutor Andrew Janz has capitalized on his opponent’s national profile, leveraging GOP Rep. Devin Nunes’ headline-grabbing moves as chairman of the House Intelligence Committee to raise buckets of money. Janz still has an uphill climb for the traditionally Republican 22nd District in California’s Central Valley. And he’ll have to balance a national message to boost fundraising with a local message to appeal to area voters. But if he pulls off a win, Democrats could gain a baseball player for their annual face-off against the Republicans. Janz said he didn’t play competitively, but he was the third baseman for a team that won the intramural baseball championships at California State University, Stanislaus. The Supreme Court fight has taken center stage in Missouri, where GOP Attorney General Josh Hawley is making the battle a key part of his campaign against Democratic Sen. Claire McCaskill. McCaskill did not support Trump’s first high court nominee, Neil Gorsuch. Hawley launched his first TV ad Monday, highlighting the Supreme Court and his work there as a clerk. Vice President Mike Pence traveled to the Show-Me State on Wednesday and slammed McCaskill for opposing GOP policies. McCaskill, though, announced this week that her campaign war chest has gotten even bigger. A second-quarter haul of $4.3 million brings her cash on hand to $12.2 million. Hawley raised $1.9 million in the second quarter, finishing with $3 million in the bank. Outside money from both parties is already starting to pour into the state. Trump carried Missouri by 19 points in 2016. Inside Elections rates the race a Toss-up. To take on McCaskill, Hawley still has to win the GOP primary on Aug. 7. A whopping 21 candidates filed to run for Senate, including 10 other Republicans besides Hawley. Air Force veteran Tony Monetti and former Libertarian presidential candidate Austin Petersen are the two other GOP contenders who have raised six-figures. For next week, reply to this email and let us know which race you want to know more about: Texas’ 23rd District or North Carolina’s 2nd District. Talk to us. It’s easy. Email us at attheraces@cqrollcall.com and we’ll get back to you as soon as we can. As always, send us any race you think we should pay more attention to and we’ll look into it. 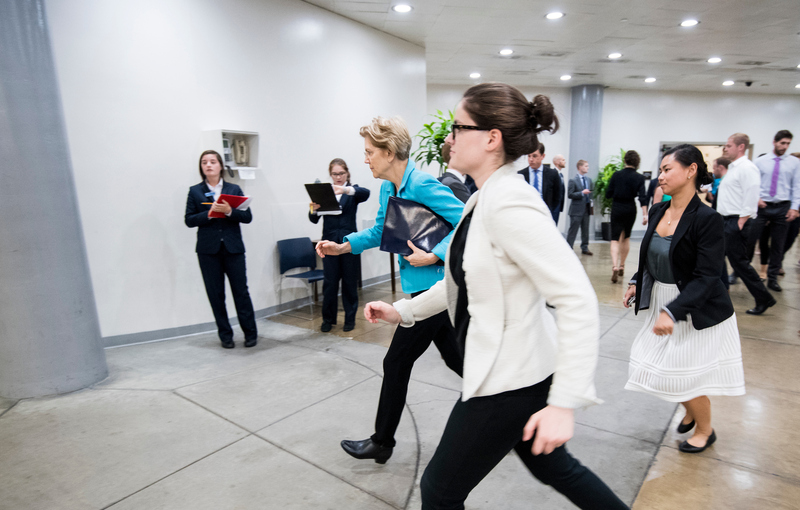 She’s running. Bill Clark gets the credit for the joke and the photo.